Borneo, the world's third-largest island, sits astride the Equator at the center of the Malay Archipelago, the Earth's largest group of islands. Among islands, only Greenland and nearby New Guinea surpass it in size, which at 743,330 km² is slightly larger than Texas. It is also the only island on the planet divided among three countries. The southern two-thirds of the island belongs to Indonesia and is called Kalimantan (meaning "diamond river"); it contains about 60 percent of the island's population, which is estimated roughly at 14 million. Malaysia's two non-peninsular states, Sabah ("the land below the wind") and Sarawak ("antimony"), hug the north coast and take up most of the rest of the island and its population. Sarawak nearly surrounds the nation of Brunei, a small sultanate with great oil wealth, which also has a coastline on the South China Sea. The island's name derives from Brunei, which was once its center of power. The island remains a sparsely settled landscape. Though it has remarkable natural resources, inspiring vistas, and increasingly rare wildlife, it hasn't developed as a travel destination to the extent that nearby spots in the Philippines, peninsular Malaysia, and Indonesian islands such as Java and Bali have. Borneo retains an image of exoticism and even darkness and dread in the popular mind. Much of this probably remains from the formerly propagated notion that the island was the home of headhunters so xenophobic that the possibility of visiting the hinterlands and retaining one's pate seemed as remote as Borneo itself. Yet the practice of headhunting was real, and the tribal peoples still retain the habit of beheading the people they come into violent conflict with. They once carried out near-constant clan warfare, a custom that doesn't die easily. With time, these peoples have been increasingly supplanted by more recent immigrant groups, who brought with them or were converted to Islam or Christianity. Now it is the aboriginal people whose lives and homeland appear most threatened. Besides the South China Sea, which lies to the north and northwest and separates it from the Malay Peninsula and Sumatra, Borneo borders the Sulu Sea separating it from the Philippines to the northeast. Completing the encirclement are the Celebes Sea and Makassar Strait to the east dividing it from the island of Sulawesi and the Java Sea, distancing it from the island of the same name to the south. Borneo's main range of mountains runs from southwest to northeast. In the south, the elevations are low, only rarely surpassing 1,200 m, but farther north along the Malaysia-Indonesia border they begin to tower, with some in excess of 2,400 m. Borneo's highest peak, Mount Kinabalu in Sabah, reaches 4,095 m near the range's northeastern end. The island has a climate that is generally wet and hot, with rain being a more common occurrence than not and some places getting 350 to 500 cm per year. Monsoons strike dependably between October and March. There is no real dry season. The principal arteries of Borneo's commerce lie beside or on its rivers, even on those with strong currents descending from the mountains. The thick tropical rainforests are believed to be the world's oldest and until recent decades covered the island completely. The coming of large-scale logging and the introduction of extensive oil palm plantations have dramatically altered the Bornean landscape. The main cities of the island are the capitals of the main political units: Kalimantan's Bandjarmasin, a river port near the southeast coast; Sabah's Kota Kinabalu on the northeastern coast; Sarawak's Kuching, a river town in the northwest; and Brunei's Bandar Seri Begawan, a city set back from Brunei Bay. The whole of Borneo was controlled by the empire of Brunei during its golden age from the fifteenth to seventeenth centuries. The Portuguese arrived in the sixteenth century and the Dutch and British in the next as a part of their furious fight for the spice trade. Brunei's power began to ebb, and the sultanate contracted to its present size by the late 1800s. At the same time, Dutch influence was spreading across the south of the island from west to east. The British later established the two protectorates on the north side. When the Dutch East Indies became Indonesia in 1950, Kalimantan was a part of the new nation. Both Indonesia and the Philippines objected when Malaya created a union with Singapore as well as Sarawak and Sabah to form Malaysia in 1963. Sporadic Indonesian-led guerrilla raids against the two Malaysian states took place until 1966. Brunei had also been invited to be a part of Malaysia but turned aside the offer. In 1984 it gained independence from Britain. Peace has largely held on the island in the decades since the three countries' independence, but in recent years there has been communal violence within Kalimantan between ethnic and religious groups. 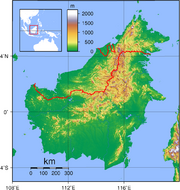 Similar to New Guinea, Borneo has historically had two distinct populations. Tribal groups low in number inhabit the nearly inaccessible interior while relatively dense farming populations reside along the coast and the rivers' lower floodplains. The inland people, called Dayaks, the legendary headhunters, have been mainly hunter-gatherers, practicing limited cultivation, speak a myriad of tribal languages, and observing animist rituals. In contrast, the coastal peoples developed sea trade, advanced farming, and fishing; speak Malay dialects; and are predominantly Muslim. The coastal population has continued to dominate the inland tribes politically and through occasional hostilities. From early on, Dutch missionaries focused on converting the Dayaks. Much less success occurred with the coastal Muslims. Today, violence erupts sporadically between the largely Christianized Dayaks and the Muslims of the coast. Among the lowlanders are tens of thousands of immigrants from the small island of Madura, due south of Kalimantan and adjacent to Java. Strictly Muslim, the Madurese began moving to Borneo in the 1960s as part of a government-backed relocation drive to relieve overcrowding in its own land. Communal conflicts in Kalimantan have risen in frequency and intensity as greater numbers of Dayaks have been displaced by Madurese loggers. In 2000-2001, there occurred a particularly virulent episode in which Dayaks slaughtered thousands of Madurese. Since the Dayaks are relatively few in number, the island in totality remains predominately Muslim. There are more than 40 ethnic groups on Borneo, speaking 65 languages or dialects, most of which are spoken in the interior. Indonesian is the principal language of Kalimantan; Malay, a related tongue, is spoken in the north, where English is also commonly used. The island's highest population density is in Sabah. A sizeable Chinese community exists around the island, but is at its greatest strength in Brunei, where it reaches 15 percent. Over the centuries, Borneo's dense rainforest discouraged large-scale agriculture, though in recent years palm and rubber plantations have made great inroads. Rice has long been an important crop but tends to be grown on small holdings. Coal and gold are mined, as well as diamonds. The exploration for and production of oil is also significant, especially in Brunei. The extraction of timber constitutes the Bornean industry that creates the most news. Borneo by itself is one of the world's largest producers of tropical timber. Much of it becomes Malaysian plywood while a large amount also ends up in the construction industries of Japan and other economically advanced countries. This has caused the island's timbered area to shrink at a rapid pace. The rainforest was also woefully decimated by the manmade forest fires of 1997-1998 that coincided with an exceptional dry season and covered most of the Malay Archipelago in an ashy haze. The remainder of the island's rainforest is the only natural habitat for the endangered Bornean orangutan, which has long been nicknamed "the wild man of Borneo" for its human resemblance. It is also an important refuge for many local forest species, including the world's largest flower, the rafflesia, which can grow to a diameter of a meter and weigh up to seven kilos. The dwindling sanctuary of the Asian elephant, the Sumatran rhinoceros, and the clouded leopard are also on Borneo. This page was last modified on 20 December 2016, at 15:31.